means bringing something into reality which hitherto had only existed inwardly in the mind. It is creating something purely out of one's mind and will and out of nothing else. The meaning of ברא is to cut or set a boundary. The intelligent person will understand what I am alluding to. Create, as used in this first verse of Genesis, means that God set a boundary, a limit, and contracted himself, His Light, to within this limit thereby making possible the manifestation of something whose consciousness can be directed to independent existence. In this way, that consciousness would not be absorbed and nullified in its Source. The first aspect of this contraction creation was heaven and earth: heaven referring to the spiritual dimension of existence, soul, and earth referring to the physical dimension of existence, time and space. The earth aspect of creation was without form and empty. This means everything was mixed up and had no purpose. The moment anything is in a way that is not fully connected to God, it is mixed up. It has no Holy purpose. That which is mixed up is dark. God's bringing into existence darkness is what is known in cosmology as the big bang. From this we learn that God created darkness. 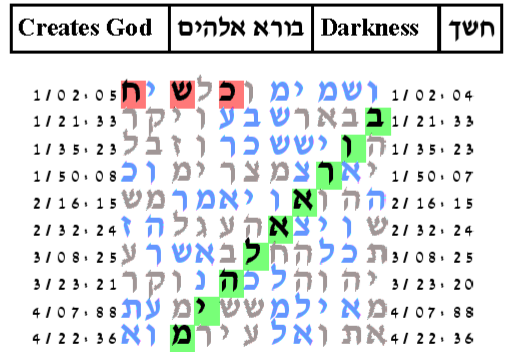 This darkness is known in the writings of the sages as fire, a primordial fire, (Nachmanides, Rambam) and associated with the Sefirah Gevurah, Strength. As a light it is hidden. God's spirit moving refers to the exponential expansion phase immediately after the big bang. Water means in a fluid plasma. Then God gave a purpose, a form, to that darkness which was made to become manifest. There was an awakening. This is what There shall be light accomplished. Existentially, purpose can only exist in a context that contains non-purpose. For purpose is form that arises out of from that which is mixed up. God distinguished between that whose function was purpose and that whose function was non-purpose. Purpose was good. God divided between purpose, which is lightness, and that which is mixed up, which is darkness. God named the lightness day and the darkness he named night. The day begins with darkness and ends in lightness. The fabric is One functioning unit. Isaiah is telling us that the darkness was created and the light was formed. This motivates us to explore the key word God creates against the key word darkness and the key word God forms against the key word lightness. 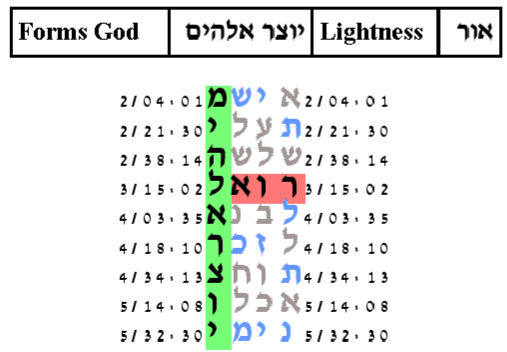 Using our standard protocol, the probability that a text from the ELS random placement text population would produce as compact combined results as we observed from the Torah text for these two pairs is 45.5/1,000. The cylinder size is 25,051 columns. The expected number of ELSs is set to 10. The probability that a text from the ELS random placement text population would produce a table as small as this one is 211/1000. The cylinder size is 27,479 columns. The expected number of ELSs is set to 10. The probability that a text from the ELS random placement text population would produce a table as small as this one is 40.5/1000.